Another coach at Stoneman Douglas High School who should have been armed. Chris Hixon was remembered as a loving father and husband, a veteran who was twice deployed to the Persian Gulf, an athletic director and wrestling coach who worked tirelessly for his athletes and ultimately, as a hero who died trying to save students at Marjory Stoneman Douglas High School. It was at the Parkland school on Feb. 14 that a gunman opened fire, killing Hixon and 16 others. Another 16 people were injured in the shooting. 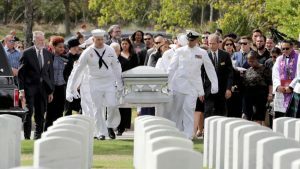 On Wednesday morning, hundreds of Douglas students — many wearing the maroon, silver and white jerseys of their respective sports teams — joined Hixon’s family and members of the Broward County schools community, filling every corner of Nativity Catholic Church in Hollywood for a 75-minute funeral Mass that preceded Hixon’s burial at South Florida National Cemetery in Lake Worth.